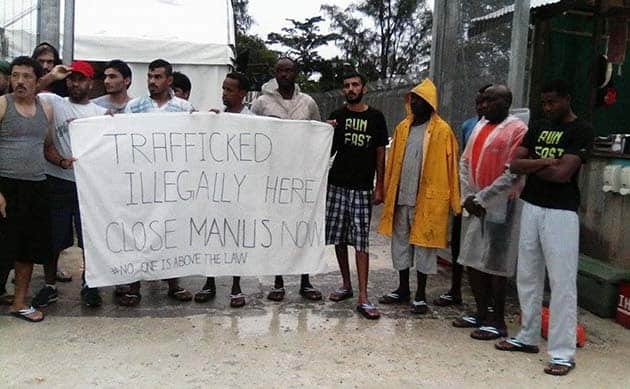 The Manus Island detention centre has been thrown into turmoil yet again, as PNG and Australian immigration reshuffle and tighten detention arrangements inside the centre. Immigration is trying to force all so-called “double negatives” to be separated and kept in Mike Compound. Some “double negatives” have been given removal notices even though injunctions ordered by the PNG Supreme Court prevent anybody associated with the court case challenging the legality of the detention centre from being deported. The government is running scared that the detention arrangements will be overtaken by the Supreme Court hearing on 27 October at which lawyers for the Manus prisoners will seek their immediate release and for all those who wish to, their return to Australia. It was a very public repudiation of Peter Dutton’s repeated claims that refugees can be resettled in PNG. Pato also made a fool of himself on Australia TV, claiming that the April PNG Supreme Court order, that the detention of asylum seekers was illegal and Manus detention centre must be closed, somehow did not apply to “the East Lorengau Transit Centre.” But that is not so. Despite the PNG Supreme Court decision, the detention arrangements on Manus are being tightened. Refugees from the detention centre are no longer allowed to even visit, let alone stay at the East Lorengau Transit Accommodation. Asylum seekers who have refused to be part of the refugee determination process in PNG have had their points cut so they can no longer access the detention canteen. These restrictions have gone along with efforts to coerce asylum seekers into agreeing to return to their home countries. Bribes to return have increased, $13,000 is common. Up to $20,000 is being offered. But despite the efforts to bribe and break people, there are very few takers. The days of offshore detention are numbered, but Dutton and the Australian government are desperately trying to save face while they trash the lives of those they should be protecting.